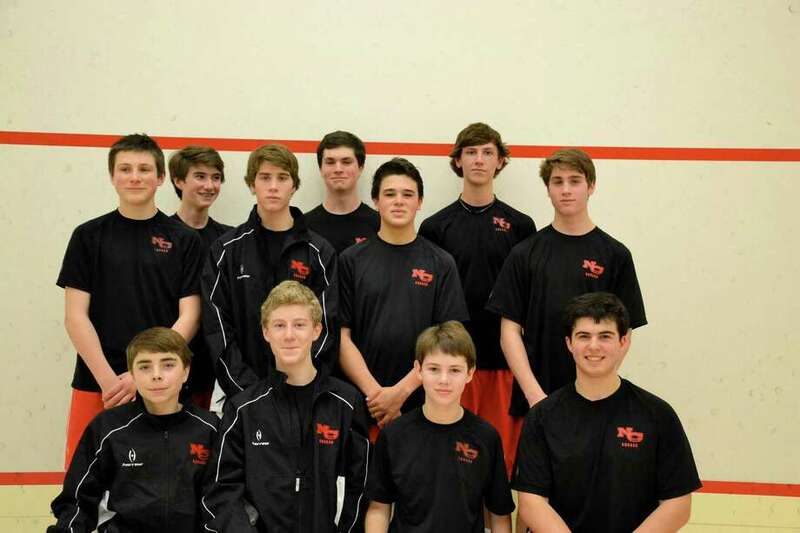 Members of the New Canaan High School squash team pose for a picture. Now in its eighth year of existence, the New Canaan squash team moved from club to varsity status last year, capping off its first varsity season last March by becoming co-champions with Greenwich in the Fairwest Division 1 Squash Championships held at Chelsea Piers in Stamford. The high school team of varsity and sub-varsity players is over 35 members strong as the sport continues to grow in popularity. Team tryouts will be held during the weeks of Nov. 4 and 11 at Chelsea Piers. Preseason play, which will run Sept. 30 and Nov. 1, is available for returning players at Chelsea Piers and for new players at Squash Alley (88 Hamilton Avenue in Stamford). There will be an informational meeting led by Liz Schmidt, parent and founder of the squash program at New Canaan High School, for all interested high school players in mid-September at New Canaan High School. Students should listen for announcements and look for flyers. In addition to the high school team, Mrs. Schmidt also coordinates squash programs at Saxe Middle School and in all three elementary schools. At Saxe, fifth and sixth graders are in a developmental program and will play at Squash Alley on Saturdays 4-5 p.m. and on Sundays 4:30-5:30 p.m. The seventh and eighth graders play competitively in a Fairwest League and will practice at Squash Alley on Mondays, Wednesdays, and Fridays from 2:30-3:15 p.m.
All practices begin the week of Sept. 30. A "Try It" night is being planned in September at Squash Alley for any middle school student who might be interested in playing but has never tried the sport. It will be an opportunity to meet the coaches, and racquets, goggles and balls will be provided. Flyers will be posted at Saxe. Contact Liz Schmidt to sign up for any of the middle school programs. Third and fourth graders from West, East and South Elementary Schools can learn to play on Tuesdays and Thursdays from 5:30-6:15 p.m. at Squash Alley. Sign up is direct at Squash Alley, 203-327-3131. To date, squash team expenses are covered by participants and the team continues to seek support through the Board of Education. The high school team is very grateful to Karl Chevrolet for providing team bags and HeliNY for outfitting the squad with jackets. Contact Liz Schmidt with questions about any of the programs at ebschmidt@optonline.net or 203-966-6886.